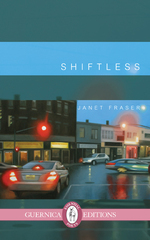 On Thursday, April 2nd, poet Janet Fraser will be holding a reading event in St John’s, Newfoundland. The reading will take place at the Resource Centre for the Arts, “the heart of theatre and the cultural pulse of downtown St. John’s,” in the Second Space room, and will begin at 7:30 PM. Fraser will be reading from her recently published collection, Shiftless (Guernica Editions Fall 2014), in which she fearlessly explores the essence of her own life, some of her ancestors’ lives, and the lives of other ordinary people who have often faced extraordinary challenges. Tagged with Janet Fraser, Poetry, reading, Shiftless.